Habit: Annual to perennial herb, generally erect. Stem: branches 0 or generally ascending to erect, hairy. Leaf: generally sessile; basal whorled, cauline generally alternate, reduced above (opposite below); generally strigose, rough-hairy, or bristly, largest bristles generally bulbous-based. Inflorescence: generally terminal, raceme- or generally spike-like cymes, in groups of 1--5 (> 5), generally coiled in bud, generally elongated in fruit; bracts generally 0. Flower: generally unscented, persistent or not; sepals fused at base; corolla tube generally 1--13 mm, limb 0.5--12 mm diam, generally white, appendages generally 5; anthers included; ovary generally 4-lobed. Fruit: pedicel 0 or < 12 mm in fruit; nutlets 1--4, generally gray to brown, smooth to granular, tubercled, or papillate, with abaxial, longitudinal ridge to not; margin rounded, sharp-edged, or a +- flat rim or wing; adaxially grooved above attachment scar, scar generally lateral, narrow, open to closed, raised or generally not, edges inrolled to sharp-angled, generally forked or flared open at base; central fruit axis ("axis") not reaching to extending beyond fruit. Species In Genus: +- 200 species: western North America, western South America, northeastern Asia (1 sp.). Etymology: (Greek: hidden flowers, from cleistogamous flowers of some South American species) Note: Generally homostylous. 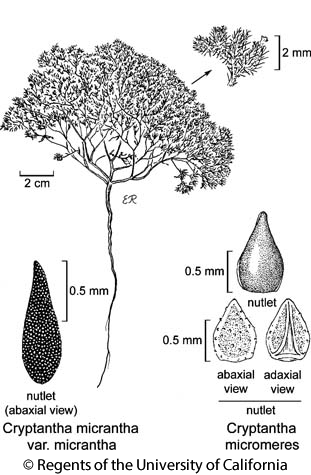 The tissue between ovary lobes, interpreted as a receptacle and/or style (style sometimes 0, then stigma attached to top of receptacle), extends to various degrees in fruit, forming what is often called the gynobase (here "fruit axis"), to which the nutlets are laterally attached at maturity, leaving an attachment scar. Annual species without yellow corolla appendages generally self-pollinating; perennial herb species generally homostylous in California. Some species, e.g., Cryptantha angustifolia, Cryptantha ambigua, Cryptantha barbigera, Cryptantha mariposae, hybridize with co-occurring species. Observation of nutlets, hairs best at 10+× generally critical for identification. Corolla limb diam generally < at end of flower period, especially for annual species Cryptantha sobolifera Payson does not occur in California. Habit: Annual, open, +- cushion-like; root, stem base red-purple. Stem: branches thread-like; strigose. Leaf: +- crowded at base, near inflorescence; 0.3--0.7 cm, oblong to oblanceolate, hairs +- ascending, short-bristly. Inflorescence: in 1s or 2s, axillary or in branch forks, dense in fruit; bracts throughout; pedicel 0.5--0.8 mm, erect. Flower: calyx +- 1--1.5 mm, 1.8--2.5 mm in fruit, +- persistent, lobes linear-oblong, strigose. Fruit: nutlets (3)4, 1--1.3 mm, +- lanceolate, white-grainy to tubercled or smooth, +- shiny, margin rounded, base rounded; abaxially rounded, ridge 0; adaxially +- flat, attachment scar edges narrow-gapped entire length, +- flared at base; axis beyond nutlets. Habit: Plant 2.5--10 cm, generally wider than tall. Stem: branches many, spreading (erect). Flower: corolla limb 0.5--1.2 mm diam, appendages minute, +- white. Chromosomes: 2n=24. Citation for this treatment: Ronald B. Kelley, Michael G. Simpson & Kristen E. Hasenstab-Lehman 2012, Cryptantha micrantha var. micrantha, in Jepson Flora Project (eds.) Jepson eFlora, http://ucjeps.berkeley.edu/eflora/eflora_display.php?tid=57141, accessed on April 21, 2019. SW (exc ChI), SNE, D; Markers link to CCH specimen records. Yellow markers indicate records that may provide evidence for eFlora range revision or may have georeferencing or identification issues. Purple markers indicate specimens collected from a garden, greenhouse, or other non-wild location.